A few months back, we had the opportunity to review an audio adventure of G.A. Henty, and now we have another opportunity! My kids are so excited! 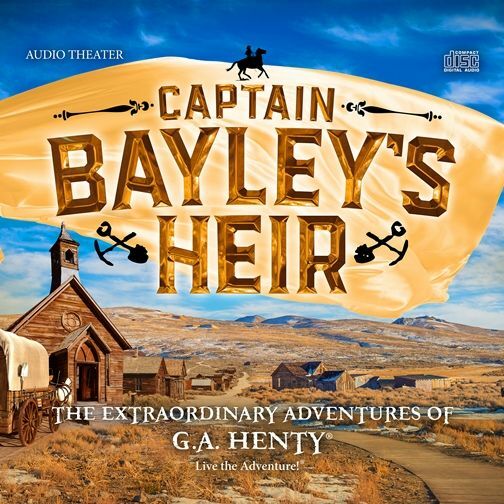 With their latest adventure, Heirloom Audio Productions has now released the audio drama Captain Bayley’s Heir! Another great audio drama featuring The Extraordinary Adventures of G.A. Henry, Captain Bayley’s Heir is sure to be a favorite in your home or on the go. The Captain Bayley’s Heir audio adventures is over 2 hours long and is based on a story of grace during the American Gold Rush time. The cds utilize “active listening” techniques to allow the listener to fully concentrate, understand, respond and then remember what is being said. As mentioned above, club members will also receive access to extra features such as the Captain Bayley’s Heir Study Guide. The Study Guide is a fantastic way to take the extra step with your kids and help them understand what is happening and see how well they have been listening. The Study Guide is set up so that you can see at which point to stop the CD and go over questions. There are sections for Listening Well, Thinking Further, Defining Words, and more. The study guide is perfect for homeschool or classroom usage. Interested in purchasing a copy of this new audio drama? You can order the 2 CD set for just $29.97 plus shipping and handling or order the “instant access” MP3 download version of Captain Bayley’s Heir for just $19.97. In our homeschool, we like to listen to audio books or music while we work on projects. The past few days we have been listening to Captain Bayley’s Heir. I really like when the audio drama starts, there are two characters talking and one is mentioning that he hasn’t done anything for God. The other character replies “Being a Christian isn’t about what you’ve done for him, but what God has done for you”. The CD beginning in that way was definitely a strong start. I really appreciate that these are clean and with good morals for my children. When I first listen to one of these dramas from Heirloom Audio Productions, I’m always amazed at everything that is happening. It’s not just listening to someone read a book. It’s like you are there, listening to something unfold. You’ll hear everything from crickets chirping to floorboards squeaking, to fire crackling, and more. It really triggers emotions with how well it’s done. My kids all enjoyed listening to Captain Bayley’s Heir and are eager for more of G.A. Henry’s adventures to be released on audio! For more information, please visit the Captain Bayley’s Heir website. You can also find out more on Facebook, Twitter, Instagram, or Google+. You can also read more reviews on this product and others by clicking the Homeschool Review Crew banner below.